Hidden Gems- Meet Olive Augustine | Nascent Naturals Inc.
Let me introduce you to Olive Augustine. 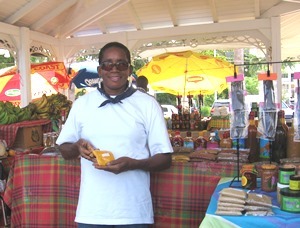 She is a street vendor in Marigot, located on the Caribbean Island of St. Martin. yes, snake oil. I asked what the ingredients were. She just smiled into a big mischievous grin and said “it’s a secret”. People come from all over to purchase this mysterious substance for achy joints. Talk about a throwback to the olden days. I asked her where she kept the bearded lady and dancing Siamese twins, but she didn’t seem to get the joke. Why am I writing about her? Well for the past 30 years she has been making and mixing most of these products herself and is very discerning with where she purchases her other goods. She even makes her own cold pressed coconut oil from a home-made contraption involving a modified juicer similar to a wet milling process. This is technology now in commercial use to extract coconut oil without solvents. She figured this out for herself. Clever woman I say! Actually I’ve been coming to the island for many years and always shop at her place. I bring back a healthy supply of herb and spice mixes that I can’t get in Canada. Even though I have drums of coconut oil in my shop, I always bring home some of her home made stuff as it is fabulous. We have great conversations about health, lifestyle, proper food, natural ingredients and living from the source where possible. She doesn’t own a computer, has no idea what email, websites and facebook are all about and doesn’t care. There’s no emphatic “look at me I do the natural thing, aren’t I so great and unique” banter; she just has passion, purpose with great knowledge and quietly lives what she speaks while making a modest living. That energy I will always be happy to support and promote as it is exactly what I believe in. 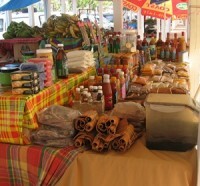 If you find yourself visiting the Friendly Island, her booth is located at the central market on the waterfront. Oh and she has a special fondness for Canadians.